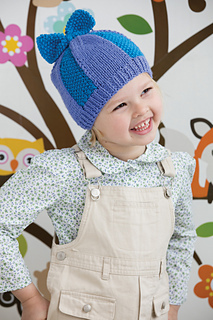 Vertical stripes create the alternating panels of color and stitchwork (seed stitch and stockinette) on this too-cute cap. It’s worked back and forth in rows and then seamed up the back. 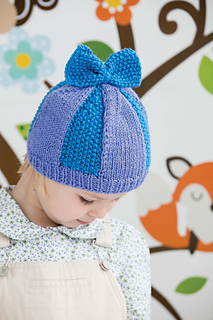 The bow is stitched separately in seed stitch and sewn to the top. Colorways used are #844 periwinkle and #848 blueberry for version 1. Colorways used are #1946 silver grey and #827 coral for version 2.